“There Can Be No Justice Without Truth”: Pablo Catatumbo. 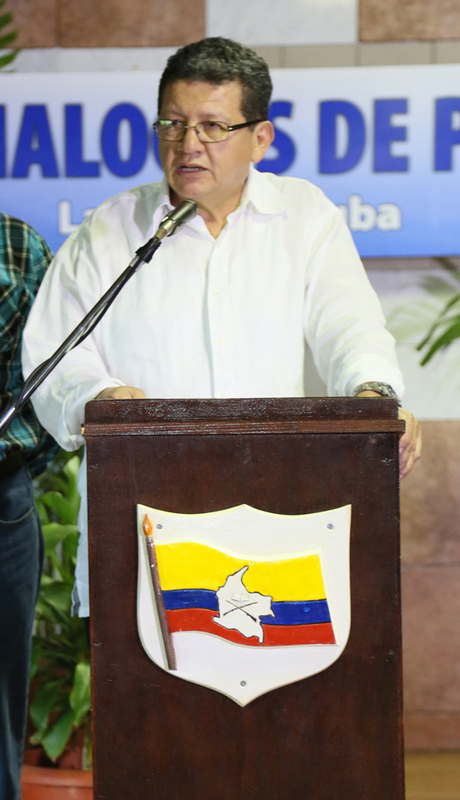 Outlining the scope of the Truth Commission, rebel leader Pablo Catatumbo stated that this is not a process directed against the FARC, because they are not solely responsible and he called on the State to fully participate. Could you describe the atmosphere at the negotiations at the end of the 37th round of talks? There had been some positive messages and encouraging signs. The 5 month old unilateral, indefinite FARC truce had resulted in an 85% decline in military confrontations. There were also additional positive signals; an end to aerial sprayings with glyphosate, what Sergio Jaramillo said regarding Simón Trinidad and the commencement of a pilot program for the decontamination of explosive artifact, when suddenly a hail of bombs rained down on us. One might well ask, what was Santos up to? To my mind it is a serious mistake for such sectors to imagine that bloodshed or gunfire will force the FARC to accept conditions of defeat. That simply will not work. We have said that to talk about justice it is necessary to talk about the truth. If a holistic truth can not be established it will be impossible to address responsibility. The war in Colombia has a multiplicity of causes, political, economic, military, moral and penal. But will not be an almost endless process to establish what has occurred during these long years of conflict? That will be the task of the Commission for Truth Clarification, Reconciliation and Non-Repitition. It cannot be proposed that we be deemed soley responsible for the complex problems of a Colombian conflict which has raged for almost 60 years now and that our imprisonment is the solution to it all. That makes no sense. This not a “Contra-FARC” process, it is a Colombian peace process. So, when will the issuse of justice the resolved? There has been some prior indication in the the Conflict History and Victims Commission reports which have been largely ignored within Colombia. They place great importance on the origins, dynamics and reasons that have led to the continuing armed conflict. There are many sectors in Colombia anxious to cast all the blame on the FARC, which is not the case. Why do they not answer to our nation for the more than 29,999 disappeared? How has this even been possible? Why are there so many victims of torture? Who can account for the murder of thousands of agrarian, union and popular leaders and the displacement of more than 6,000,000 country dwellers? Why do we not establish the truth about who violently grabbed, and subsequently registered, more than 7 million hectares of their lands? How can it be explained that all this took place in full view of civil and military authorities and almost always with their direct involvement or complicity? How has it been possible that for 30 years paramilitaries have been active close to military battalions, in urban centers and municipal towns without there ever having been a skirmish between them? These are issues that must be examined by a commission for clarification of the truth. The truth is required if we are to have peace. Are we talking then about something told by one side to which the other can respond with their version of events? No, this will not be about one version or another, it will be about clarifying the truth about what has has happened. What is not in doubt is that for thirty years only it is the rebels alone that have resisted the paramilitaries.The State needs to answer as to why it has permitted them to act with impunity, carrying out massacres, forcing displacements and forcibly evicting people from their lands under their very noses for thirty years. Horrors of every sort have happened here. How then can the issue of justice in the peace process be resolved if at the talks there are allegations and counter allegations? The truth will be revealed as we progress, we need to courageously grant it great importance. Without truth there cannot be justice. It is not enough to simply know the horrors of war, it is necessary to understand it’s origins, it’s causes and dynamics. Once we have pieced this jigsaw together we can search for a formula that will bring relief to the victims. This, by necessity will be a realistic and inherently Colombian formula that takes account of events that have occurred during these long years of bitter confrontation which will satisfy the victims, Colombian society as a whole and the international community. This is a tall order but it is how civil wars all around the world have been resolved. There is no other way. It is being said this issue of justice has caused the peace talks to stagnate. How can the dialogue progress in the absence of a solution of the matter? We are adamant that the reconstruction of what the conflict has involved can be advanced via the conformation of the Commission for the Clarification of the Truth and that this will contribute to reparation and non-repetition. The problem has been that many sectors and the representatives of multilateral entities have endeavored to impose the notion that there is one universal consensus on transitional justice models and they are promoting the idea there a consensus on who holds ultimate responsibility. We do not believe this to be the case. There is no such consensus. We need to build a political solution, alternatives between Colombians. The recovery of truth, non-repetition and the extension of democracy are implicit elements of the search for an end to war. If what you are saying is that this issue of justice must not become an obstacle to the primary objective of the peace process which is reconciliation, how then can Colombians forgive each other? My friend, we need to remain very realistic about this. There are many on the extreme right who insist that FARC be condemned and one asks, what about the rest? It is these very right wing extremists who have historically fueled violence … and what? Is it that the ruling class are not accountable in our country? Do the traditional parties not share responsibility? Did political leaders, ministers or members of the security services not participate in the war? It is unimaginable that one side only might be responsible for fifty years of war. This is a long, cruel conflict. There are multiple causes, multiple responsibles and distinctive degrees of responsibility. The Colombian conflict cannot be observerd with one eye closed; broader vision is essential. Let me cite an example, there are legal and journalistic documents in which the DAS is described a criminal enterprise. And what of this enterprise’s dependency on the President of our Republic? Who will answer on that? Who are those on the other side with ultimate responsibility? These are negotiations between equals. This is not a process against the FARC, it is a peace process. Which is why the concept of ultimate responsibility is not viable. You are saying in so many words that most responsibility lies with the other side. Does this mean that FARC might accept this model of justice? Let us start with the fact that this is a conflict with a profoundly political character for which the State is principally responsible. From there are many others responsible. We have always been willing to talk about everything that has occurred, about our own actions. But, is the State prepared to assume it’s own responsibilities? Neither of us had been born when this war began. Colombians of our generation are obliged to call leaders to account for the past 50 years. English Translation Courtesy of Sean Joseph Clancy. 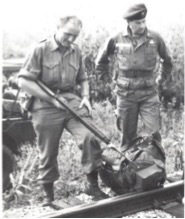 In a previous article (in Spanish; NT) we referred to Brigadier General of the US Army William P. Yarborough and his impact on the Colombian conflict. Given the unfortunate consequences of his “asistente” – the longest conflict of the Western Hemisphere – it makes sense to review some aspects of his life that will shed light on Nortamerican militarism and its global impact. Our character was born in Seattle in 1912 in a family of high-ranking officers with aristocratic origins going back to England. He graduated as a lieutenant of the Military Academy at West Point in 1936, joining the bodies of paratroopers deployed in the Philippines. In the Second World War and now with the rank of major, he led the US aerotrasportadas despliege on Algeria, France and Italy, standing out in the field and he was finally promoted to lieutenant colonel. After the War, he participated in the design of the American strategy in Europe and was an adviser to what would become NATO. He worked on similar projects in Cambodia, where he began to familiarize himself with counterinsurgency issues. Between 1958 and 1960, he was chief of the US counterintelligence batallion in Stuttgart, West Germany. 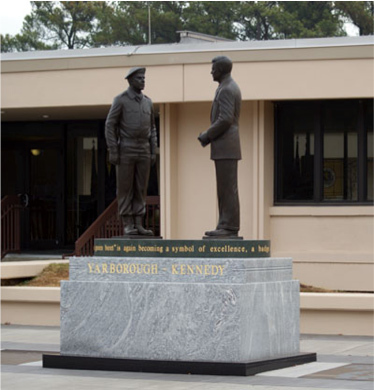 In 1961, being a brigadier general, he was appointed commander of the newly established Special Warfare School at Fort Bragg, where he would play a key role in the design of tactical operability of the military forces during the most difficult years of the Cold War. 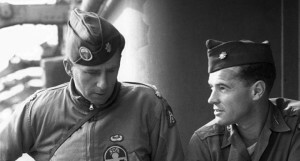 Yarbourough is recognized for having modernized the army and as the Father of the Green Berets, Special Forces units of counterinsurgency and covert overseas operations, to which he dedicated time and efforts, despite the resistance of several arms of the Armed Forces. His close relationship with President John F. Kennedy allowed him to obtain the necessary leeway for his work and this way he got hold of the command of the special units that served in Cambodia, Laos, Vietnam, Iran, Venezuela, Cuba, Nicaragua, Panama and, of course, Colombia. According to Yarborough’s viewpoint, the Special Forces (especially the infamous Mike Force) had to penetrate enemy territory, operate as mobile guerrillas and build armed anticommunist groups within the population. This was how they worked in Vietnam, where the Mike Force trained guerrillas made up of ethnic minorities who opposed the communists, and then use them in joint operations of regular and irregular forces. Now we can understand his visit to Colombia in early 1962. The US general is the father of the paramilitary strategy that is causing havoc on the Colombian countryside, even before the uprising of the revolutionary guerrilla groups. 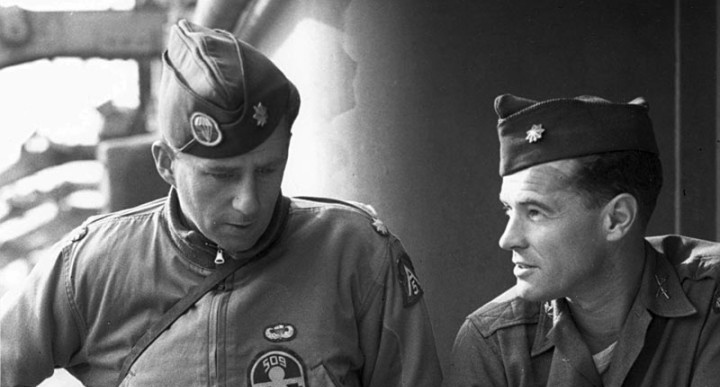 While he was still commander of Fort Bragg, Yarborough wrote in 1964 a curious article in the Chemistry magazine of the Armed Forces of the US. In it, he addressed the need to include chemical warfare in the arsenal of the counterinsurgency. He defended this thesis at all costs, graphically comparing the struggle against communism as the battle against a nest of insects who must be fumigated. 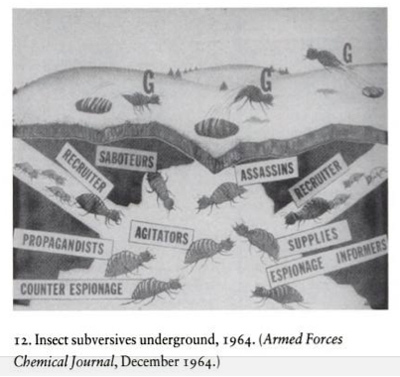 The guerrillas, represented as some sort of aphids, have their own division of revolutionary work (murderers, tos en charge of sabotage, recruiters, spies, counterintelligence agents, informants and logistical support). But the “fumigation” was not only military. The general stressed the need for the counterinsurgency forces to undertake propaganda work to win popularity “among workers and peasants”. The classic “civic-military actions” he recommended to the Colombian army were part of his usual recipe against communist rebels. Yarborough’s career did not stop there. 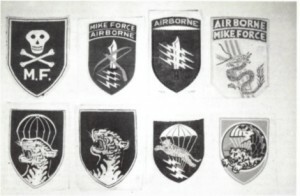 In just seven years he managed to promote from Brigadier General (1961) to lieutenant general (1968). After administrating the School of Fort Bragg, he served as senior researcher of guerrilla movements for the Pentagon’s Special Operations unit; he was a field officer in Southeast Asia and in charge of operations and intelligence at the highest levels of the Pentagon. He retired from active service in 1971 with high honors and decorations. In 1979 he published his only book “Bail Out Over North Africa”, a collection of memoirs of his Algerian campaign in World War II. He died in 2005 and was buried with honors in Arlington’s National Cemetery. In Fort Bragg there is a sculpture of Yarborough together with President Kennedy, with whom he spread modern imperialist counterinsurgency worldwide. His life takes account of the history of the US military forces and its global project. Yesterday in Tolima 68,000 mobilized against the mining and energy projects that President Santos seeks to impose in this department. Despite being this mobilization one of the most massive protesta seen in Tolima in these years, the mass media did not report on it. 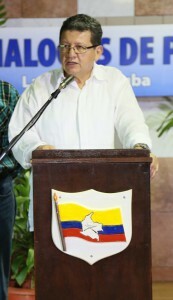 50.000 people mobilized in Ibagué (the capital of the department), 10.000 in El Líbano, 5.000 in Españal, 1.500 in Saldaña and 800 in Honda. The mine La Colosa is one of the largest gold projects in the world. La Colosa gold project is 100% owned by AngloGold Ashanti, the world’s third largest gold producer. The project will have mayor environmental consequences in the area; among others, it will seriously affect the water resources available for agriculture and for the population. Production was originally planned to begin in 2016, but has now been delayed until the end of 2019.